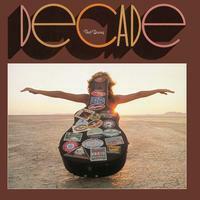 "Decade" is a compilation by Neil Young, originally released in 1977 as a triple album. It contains 35 of Young's songs recorded between 1966 and 1976, among them five tracks that had been unreleased up to that point. It peaked at No. 43 on the Billboard Top Pop Albums chart, and was certified platinum by the RIAA in 1986.